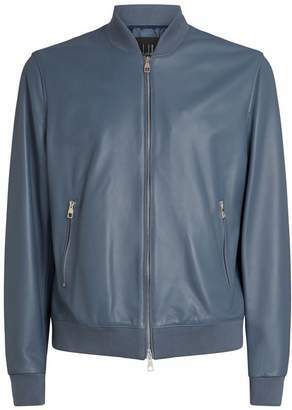 Overview A refined take on a sporty silhouette, this Dunhill bomber jacket is imagined in smooth leather. Framed with rib-knit trims, the Italian-crafted piece makes the perfect layering piece for your transeasonal edit. Style with a polo shirt and sweatpants for a casual weekend ensemble.